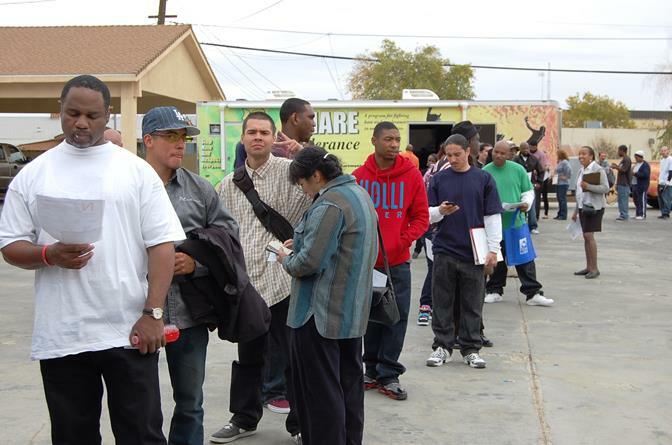 A long line of attendees wait for service at a Community Resource Fair Tuesday, Nov. 12, at Paving the Way Foundation, located at 44814 Cedar Avenue in Lancaster. Parolee Richard Washington (right) was one of about 300 attendees. LANCASTER – Having spent more than half his life behind bars, 58-year-old parolee Richard Washington said he was committed to making a positive change. “I used to not know how to be free, but now I like being free and I don’t want to go back,” he said. Ryan Henry, a recovering substance abuser, said he too was committed to turning things around. Ryan Henry (right foreground) said the event offered hope and a second chance for people like him. Washington and Henry took important steps toward their goals Tuesday morning. 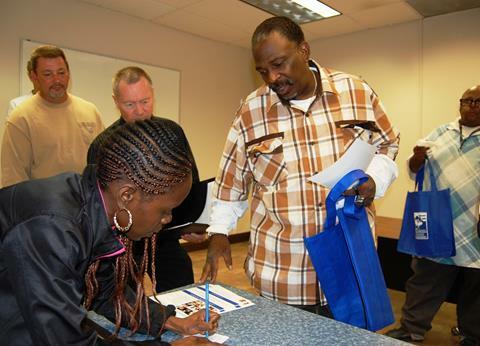 The men were among the hundreds of attendees who took advantage of a Community Resource Fair in Lancaster sponsored by Paving the Way Foundation. Tuesday’s Community Resource Fair featured about 20 organizations and government agencies offering information on everything from expungement assistance and job training to housing assistance and social service programs. The idea was to offer a one-stop shop for ex-offenders looking to reintegrate into society or for residents simply looking to get back on their feet, Hodge said. The Fair was the first of its kind for Paving the Way, and the event drew an estimated 300 attendees, Hodge said. For more information on Paving the Way Foundation or if you would like to be notified about the next Community Resource Fair, contact 661-339-2733 or visit www.pavingthewayfd.com. 6 comments for "Community Resource Fair draws hundreds"
Thank You so much Nancy. When I called and invited other organizations and passed out the flyers I didn’t know that it was going to be so effective. I’m already planning for the one on December 10, 2013. If we can keep focus on the solutions and not the problem we will be successful. I have taught the life skills class for three years and so many of the clients have made tremendous changes to their lives for the better. I need all the support the community can give. Amen. Thank you for all that you are doing, Ms. Sarina. People sit around and complain about what is dragging down the AV, but you are actually out there in the trenches working to make this community better. I commend you and everyone else at Paving the Way for truly making a difference in our community. I look forward to reading more great things about your invaluable organization. Is that guy in the top photo REALLY flashing a gang sign at the photographer?!!! I hope not and it’s just a combination of the camera catching that split-second hand movement combined with my expectation based on the topic of the article. No the guy is not throwing a gang sign. It’s the peace sign. I was standing there and know the young man and he is not gang affiliated. Often we misconstrue other people due to their circumstances. It’s time to reevaluate our community and see people for who and what they really are instead of what we feel they aught to be. I hope this program has the desired effect. Good luck and pay attention to everything. Organizers want you to succeed.